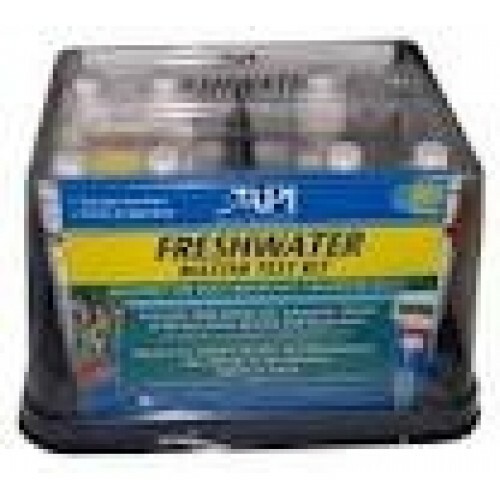 Liquid Test Kits This kit tests tap water and aquarium water for five different parameters that affect the health of freshwater fish: pH, High Range pH, Ammonia, Nitrite and Nitrate. Highly accuate and economical. Unique, transparent dome allows clear view of contents. Includes all tests required to test the nitrogen cycle. Kit includes computer-calibrated and laminated color cards, 4 glass test tubes and holding tray. Also contains complete, step-by-step instruction booklet, including information on how to correct unsafe water conditions. Compact and easy to store. Over 800 tests.